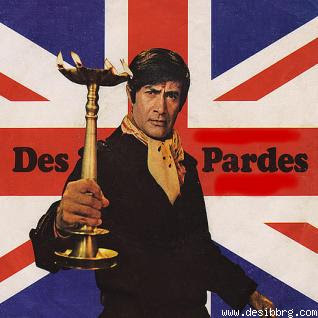 Having already served as a producer to many of his movies from the 1950's, Dev Anand added directing to his formidable role of entertainer extraordinaire in the 1970's and 'Des Pardes' was one of the biggest hits of his career. Dev was always fascinated by all things European and sought to include those things in his films whether they consisted of shooting locales or background extras. Sometimes he just up and moved the whole movie to a European country as he did halfway through this one when he had the topsy turvey plot move the adventure to England. This movie comes very close to being in the genre of Bollyweed but takes itself a little too seriously and (with the exception of some great song sequences) is just not crazy enough. The plot is fairly straightforward - at least as far as 70's Bollywood movies go. It involves the elder brother of a poor Indian family striking it rich and getting a job opportunity in England. At first the job seems to be going well but suddenly the brother stops writing his family and his younger brother (Dev Anand) gets the call to go find him. What he finds when he gets there are thousands of other Indians (his brother is MIA) who are living in squalor on fake passports and being held hostage by other Indians who are garnishing their wages and threatening them with deportation should they get out of line. And his brother? Well nothing good can come of such nefarious folk and after some time he realizes that very bad things may have happened to him and to say anything more would violate the spoiler-free rules of Doc Bollywood! While this movie comes in a tad too long at just under three hours, there are some things that I just love about it. For starters, it serves as the debut film of one of my favorite actresses - Tina Munim. She was not only a natural beauty but effortless as an actress as well. She had the girl next door naivety on the surface about her but was able to stand up to even the fiercest 'goonda' if need be. She ended her movie career after only a few films but went on to even greater things marrying the billionaire Anil Ambani and dedicating her post Bollywood life to humanitarian and social causes. 'Good' Pran. 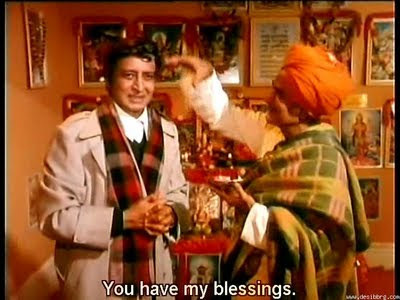 It's no secret that Pran is one the most beloved actors in Bollywood but there is something even more special about him when he appears in films as a good guy. His life plays out much like a Bollywood movie as his career started out his career in the Hindi film industry in 1942 opposite Noorjehan after he had established himself as villain in the burgeoning Punjabi film industry of Lahore. After Partition he moved to Bombay nearly penniless and had to establish himself all over again eventually ending up with both a Filmfare Lifetime Achievement Award and the Padma Bhushan Award from the government of India. The movie is amazing.....and you have described it very well in your blog. Thanks for sharing it.